What are some of the more popular or well-known images for Christ that we would recognize as Catholics? Obviously one of the first images that comes to mind is the cross. Christ has transformed that image—once a threatening symbol of the Roman Empire’s pitiless power—into the most potent expression of God’s total self-gift and love for us. When we see the cross we are immediately reminded of Jesus Christ and His forgiveness; we are constantly reminded, in the cross of our Lord, of this grace of God offered to us all. Actually, the “X” comes first and is the Greek letter “Chi” (pronounced “kī”) while the “P” is the Greek letter “Rho” (pronounced “rō”). These are the first two letters in Christ’s name in Greek: Χριστος. Christians for centuries would see those two Greek letters and immediately identified them with Jesus Christ. We still see the Chi-Rho on vestments, engraved in chalices and in Catholic Churches everywhere. But perhaps a less known symbol for Christ is one that goes all the way back to the Second Century: the image of the pelican. Early Christians would see the pelican apparently piercing her own breast with her enormous beak, and then proceeding to feed her young; in actuality, the pelican was clearing its beak of the small fish it had caught, and pressing them against her breast as she then passed them on to her nestlings. The Christian faithful, nonetheless, saw here an image of Jesus Christ who allows Himself to be pierced so that He can feed us with His own body and blood in the Eucharist. 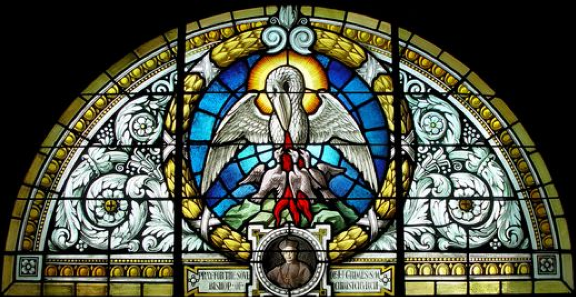 If you visit many of the great Gothic cathedrals or magnificent basilicas throughout the world, in splendid marble altar pieces and luminous stained glass arrangements there are images of the pelican. Tótum múndum quit ab omni scélere. O good and loving pelican, Jesus my Lord! Is ransom for a world’s entire guilt. In the City of Brussels, in the beautiful Cathedral of Saint Michael and Saint Gudula, there is a quiet sanctuary called Our Lady’s Chapel. It is dedicated to Our Lady of Deliverance, and there is an impressive altar there held up by two enormous, sculpted pelicans. One of them is piercing its side with its beak, while the other stretches its head up toward the altar. Two generous wings, outstretched, support the altar above. The symbol is clear: Christ allows Himself to be pierced and wounded on the altar of the cross so that He can feed us with His body and blood in the Eucharist. I mention this image of the pelican because in our Gospel from St. Matthew this weekend we find a poignant expression of Jesus, the good and holy pelican. St. Matthew tells us that Jesus has just learned of the death of St. John the Baptist. Remember, John was His cousin; Jesus obviously loved him a great deal. Having heard of John’s execution, Jesus did the most fitting and expected thing perhaps any one of us would have done, He “withdrew in a boat to a deserted place by himself” (Matthew 14:13). He wanted to be alone with God. Suddenly, though, the crowds who have anticipated His arrival surround Him as He disembarks. There will be neither silence nor solitude for Christ in this grief-filled hour. But how remarkable, the response of our Lord! He does not become frustrated or flustered; He complains not in the least. Instead we are told that “his heart was moved with pity for them, and he cured their sick” (Matthew 14:14). In the midst of His own personal loss and from the depths of His vulnerability He loved them and He fed them. Still fresh from the experience of the death of the Baptist, He who was still wounded reached into the depths of Himself and taught them. He preached the Gospel of the Kingdom of God to them and they heard Him gladly, all day long. As the sun begins to set the disciples will size up the situation and recommend that the Master dismiss the crowds. There are thousands of people and they have nothing physically to eat. “There is no need for them to go away,” Jesus responds, “You feed them yourselves” (Matthew 14:16). The disciples were astounded. Feed them with what? Nonetheless, they bring to Him the simple offering of two loaves and five fish and Jesus, the good and loving pelican, brings the loaves to His breast and breaks them; He gives thanks to God for these gifts and then He distributes them to His disciples who in turn given them to the hungry crowd. The great miracle of the Feeding of the Five Thousand, of course, is a foreshadowing of the miracle of our Lord’s body and blood for us in the Eucharist. On the night before He suffers and dies on the cross Jesus takes bread, exactly as He does here, and he breaks the bread, giving thanks to God and says, “Take this, all of you, and eat of it, for this is my body which will be given up for you.” He distributes His body and His blood to them at that sacred meal and commands them “Do this in memory of me.” He who was pierced and wounded on the cross, this good and holy pelican, feeds us with Himself in the bread and wine that becomes His body and His blood for the life of the world. The Eucharist is simply the greatest Gift we could ever receive on this earth because it is the very Gift of God Himself in love for us. But that Gift only comes to us through the hands of unworthy men whom God has chosen to be priests of Jesus Christ. In every age, consistently and without failure down though the centuries, God has called unworthy men to be consecrated to Him and to participate in the one priesthood of Jesus Christ—to act in persona Christi capitis, in the person of Christ the Head of the Church—as he confects the holy Eucharist in the Sacred Liturgy. God is calling men now, in our diocese, to answer this call and to become priests of Jesus Christ. One of the greatest challenges we face in our culture today, of course, is that it can be increasingly difficult to distinguish that voice and hear the call of God. Our culture is one predicated on activity, productivity, entertainment and distraction. As T.S. Eliot put it, we are “distracted from distraction by distraction.” It can be difficult to tune-in to the voice of God, who speaks in silences and in whispers, but more powerfully and more efficaciously then wind, earthquake and fire (1 Kings 19:9-18). What God asks of us who are now listening to Him is prayer.